The most interesting thing has happened. Over the last few weeks I have had the honour of watching something beautiful unfold before my eyes. This something beautiful is my driveway. Yes, that is correct; I watched my driveway – every day. Actually, many times a day. It’s spring here, and with spring comes new growth, and my driveway has been growing, huge bumps have been developing on its smooth, dark surface. Last fall I had my driveway paved. Shortly thereafter the winter came and it was covered in snow. Since it was cold, I really didn’t go outside much, except to shovel the driveway and throw the occasional snow ball at my daughter. This spring, I noticed a little bump on the driveway’s surface, and I dismissed it, thinking that it was always there and just didn’t notice it. One afternoon my daughter and I were drawing with chalk on the driveway, and she incorporated the little bump into her picture. After a few days, I noticed that the bump grew a bit bigger, and that her picture became a bit deformed. A few days passed and I noticed another bump begin to form, and few days after that, another! They began to look like humongous warts in the driveway. What the heck was going on here? All of a sudden, these bumps began to crack. They kind of looked like fresh crusty buns freshly out from the oven. I tried pulling up part of the asphalt but it was too difficult. I looked more closely at the bumps and saw a flicker of green. I thought to myself “No, it couldn’t be.” The next day, my daughter and I went to look again, and she shrieked “Mommy, look!” I turned to look at where she was pointing to. I couldn’t believe my eyes! There was a sprouting! Growth was shooting upward from beneath the pavement! How amazing! Of course, I can’t have something grow in the middle of my driveway, and so as I wait for the paving company to come and do repairs, my daughter and I watch with amazement as this little life form grows. Each morning as we leave the house and each evening as we return, we check on its progress. We are dumbfounded at its resilience and will for life. Even though we know that it will need to be removed, we root for it, encourage this tiny little thing to grow in the most sub-optimal environment imaginable. However, think about it for a while. At some point, a little seedling blew onto the pile of dirt which was my driveway last summer. Then a pile of rocks were laid on top, and about four inches of asphalt afterwards. That little seedling had a will to live, it had a purpose. Throughout the winter it rested, and then when the earth grew warm, it decided to start its journey. The only way it knew how to was to move towards the light. 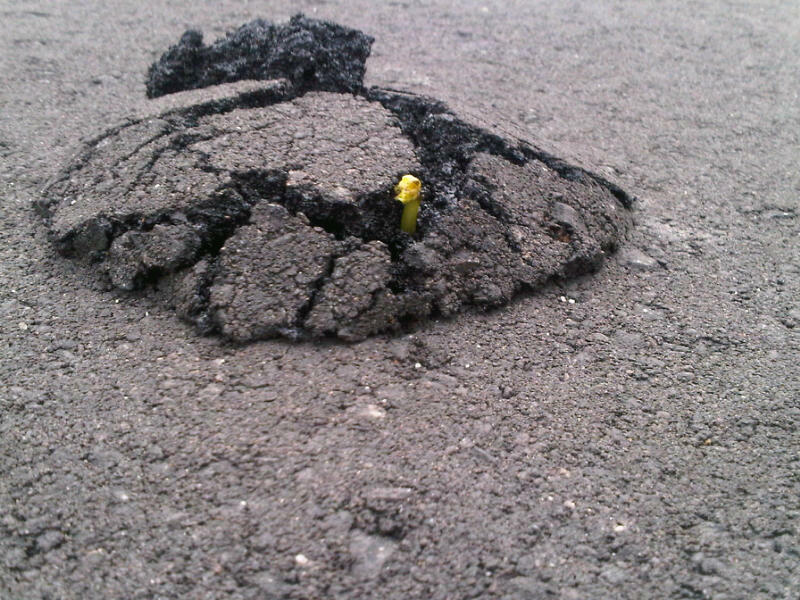 And so upward it grew, pushing its way through the dirt, the rocks and the asphalt. It was difficult, but in order to survive it had to do that, and didn’t know any other way. It is a little hero. So I thought to myself, why I wanted to give up so many times in my life. At times I found it hard to go on and didn’t have the strength to move forward? Mostly I believe it was because of fear, and hard work. In the end, I got through it. And now I see that I was like that little seed. The purpose of my darkness was to germinate, and then face my fear and go into the light so I could grow. There will always be asphalt, or dirt, or some other brown substance thrown on top of me. But no matter how much falls, the only thing to do is plow ahead. Keep moving towards the light. Life won’t get any easier, it never does. I do believe that we are all given our load to carry, but one thing is for sure, that we get stronger and more resilient with time. I often wonder how such a little thing can be so strong to warp the driveway and make cracks through it to grow into the light. I think back to elementary school to when I learned the lifecycle of a plant. It isn’t only the sprout which is doing all the work. It is rooted deep within the ground where it draws on the energy from the earth, water for nourishment. That also is true for me, for all of us. I find that when I go back to my roots, to the people I love and who love me, I get the support I need, I am able to gather the strength to make it through my difficult times. But when I don’t do this, I am limited by what I allow myself to be limited by, my own mind. When I surround myself with love, then I become more self aware, and I find that anything is possible, if I really put my mind and energy towards it. It’s about not becoming victim of life, but rather a person who lives life. I know a person who has shot out through some amazingly tough covering in the last year! The interesting thing is that this person shows all the fragile innocence and beauty of the little sprout in your photo. What impresses me is that she doesn’t expect her growth to be self-powered, but rather a part of the organic process that draws energy from the very nature that sprouted the seed. Love flows through her from the well of love. So yes, I love your post, and relate very much to your story. You made me cry tears of hope.